Bonjour mes belles! 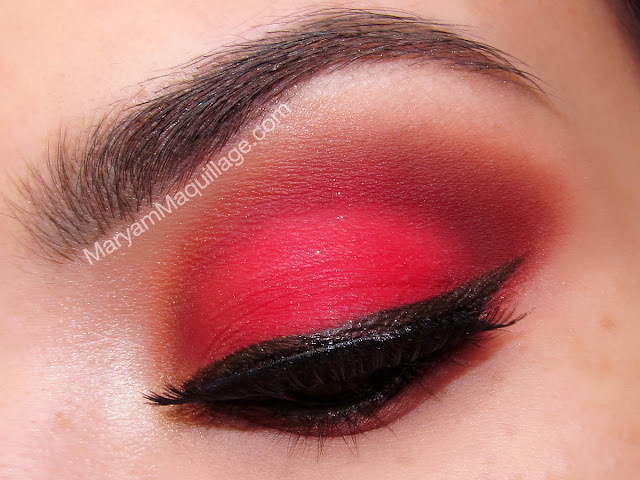 C'est moi Maryam, and today I'm up close and personal featuring a daring Valentine's makeup & nails look for the rebel girls. Is that you? 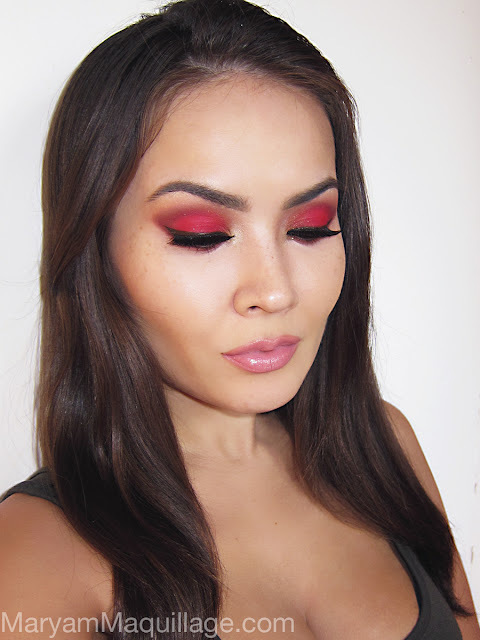 I love the idea of a smokey eye using unconventional colors -- in this case red -- so I'm pairing it with a set of badass studded nails, inspired by talismans of protection and soft baby pink lips for a dose of innocence. How's that sound? China Glaze Nail Lacquer -- Magnetix II Collection -- Gold Fusion -- China Glaze's Magnetix II Collection contains iron powder which is attracted to the magnetic design. China Glaze Nail Lacquer -- Tranzitions Collection -- Altered Reality -- China Glaze Tranzitions feature transformational colors that reveal a new shade by adding a clear top coat. Any crystal clear top coat will change the color of Tranzitions. Therefore, when you use a top coat to create nail art, you should not add an additional top coat, as it will change the entire nail color. Tranzitions is designed as a durable lacquer that dries with a satin finish without the application of a top coat, similar to that of a matte lacquer. Missha M Perfect BB Cream #27 Honey Beige -- this is my secret to flawless-looking skin. Nothing photographs better and looks more natural in person than this cult-favorite BB cream by Missha. I wear this product when my skin is fairly good and doesn't need much concealing, though Missha provides excellent medium to full coverage. Bitten (matte maroon red) -- outer "V"
Makeup Geek gel liner in Mobster (deep chocolate brown) -- another amazing product with incredible color payoff. Make sure the rim the entire eye with liner to avoid looking "all cried out"
I'm loving this! MUG lipstick in Innocent isn't the most pigmented lipstick you'll find, however, it feels light on the lips, is quite buildable and hydrating, plus, it lasts for hours. 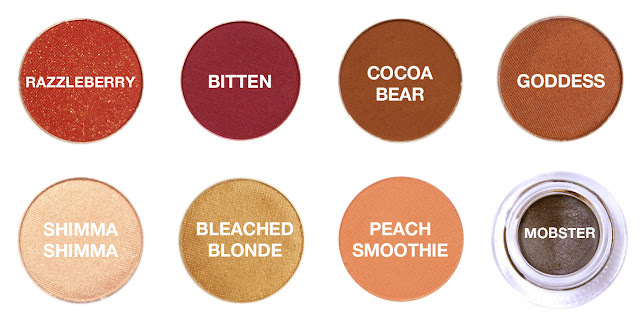 I am really impressed and am eager to try more MUG lipsticks. For $8 a pop -- it's a steal! Both nails and makeup is FAB! 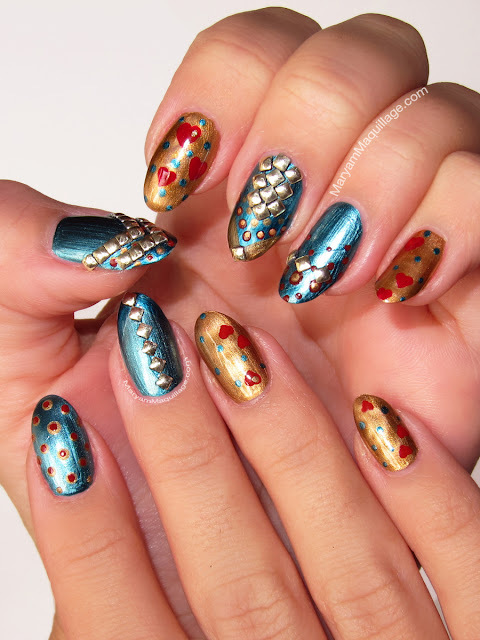 omg those nails are amazing!! Those MUG shadows are dazzling. 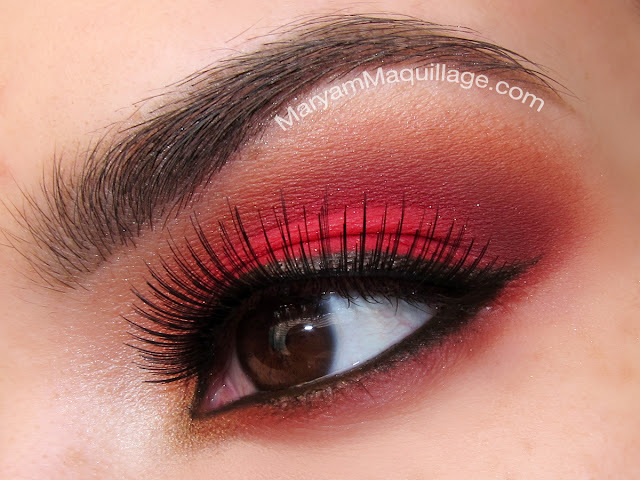 Maryam, I didn't think that it was possible to do a flattering, red smokey eye look, but you've proved me wrong! This looks great! wow just wow. I love your nails. The details on the nails are impressive. Wow can you say amazing!!! your eyes are gorgeous love the ombre look! This is some lady in red femme fatale realness right here! Wow, they look awesome and the colour looks so rich and bright, I need to buy them immediately. Love everything about it: the nails, the eyes, everything! Love the nail design and 5)3 makeup! Looking great! I did something like this but added black in my crease. Gorg! Maryam....I did this look today at work, we had wear your favorite color team day for the Super bowl and of course if I wore the red eye look, I don't have to say who my team is (smile). Got a lot of compliments, used a lot of M.A.C shadows, don't have the shadows you used, but it worked out similar.....Thank you, the look is awesome! !